At around 2:05 a.m. EDT (0605 GMT) Thursday morning (March 20), a 45-mile-wide (72 kilometers) asteroid 163 Erigone will eclipse Regulus, as seen from a swath of North America, making the 22nd-brightest star in the sky disappear for a few seconds. The predicted occultation path of the bright star Regulus by the asteroid 163 Erigone on March 20, 2014 is shown in this map by Geoff Hitchcox/IOTA using Google Maps. The blue lines show the outer edges of the zone where Regulus will be blacked out if the prediction is perfect. Astronomers expect the prediction to be closely on target; the actual shadow path is almost sure to fall somewhere between the slightly wider uncertainty lines (within the red lines to 68-percent probability, within the gray lines to 95-percent probability). 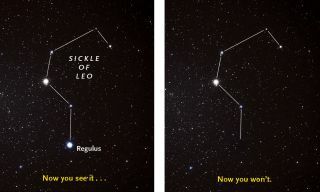 "In my entire 40 years as a professional astronomer, I've never witnessed a star as bright as Regulus — Leo's 'alpha' luminary — being blocked as seen along a populated Earthly path in an easily accessible region," Slooh astronomer Bob Berman said in a statement. "That's what will happen early Thursday morning," he added. "It’s hard to describe the excitement of this event. Regulus will vanish, and the constellation Leo will temporarily look totally different for as much as 14 seconds, as seen from New York City and about a 100-mile wide path extending to that city’s north and west." Observers in New York City can design a (very late) night on the town around the occultation. The Intrepid Sea, Air and Space Museum and the Amateur Astronomers Association of New York are hosting a 163 Erigone-Regulus event tonight, from 11:59 p.m. to 2:30 a.m. EDT (0359-0630 GMT).